I’ve always been fascinated by the idea of space travel. As a kid I watched all of the Apollo missions from Apollo 7 forward. On July 20th, 1969 I stayed up late to watch the first manned lunar landing and a while later, the first EVA on the moon. I have always found Flight simulators, space travel simulations and games to be fascinating. Especially when they model real physics. 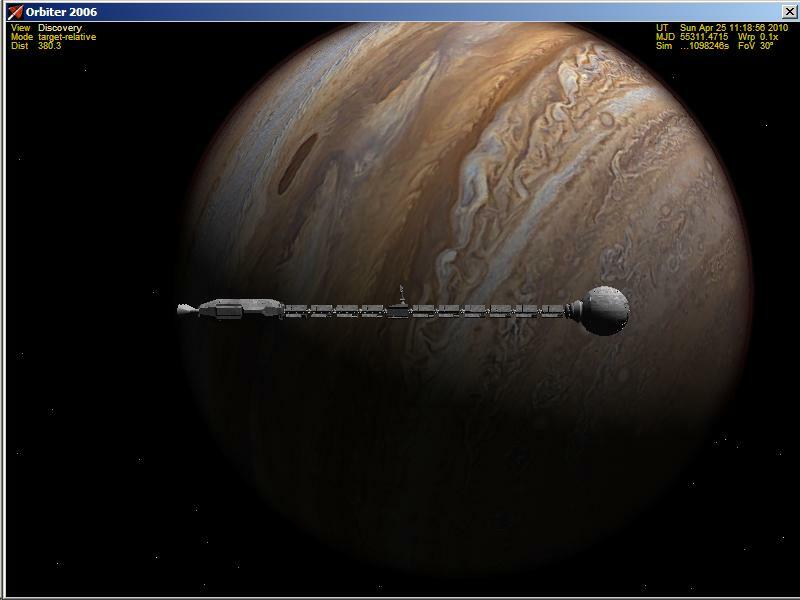 So it’s no surprise that I have occasionally spent time with simulations like Orbiter 2010. Recently I was playing around with it and I remembered that in my old copy of orbiter 2006 I had an add-on that included the Discovery of “2001: A Space Odyssey” fame. Given that, I just had to attempt the trip to Jupiter. Because of the distance involved, I spent most of the trip at 100,000x time acceleration. Even doing that, it still took over three hours in real time. I made some kind of monstrous error in my launch trajectory. The trip should not have taken more than about two years or so. I finally arrived in Jupiter space sometime in mid 2007. It took no less than at least 30 course corrections (it could easily be more, I lost count) to decelerate and actually get into an orbit around Jupiter. That orbit was huge. At first it was a little over an A.U. (an A.U. is an “Astronomical Unit”, approximately 93 million miles) in diameter. I finally managed to get my closest approach near enough to Jupiter for it to be the dominant gravitational source by about the middle of December 2009. Travel time was just over eight years and three months. Mostly because I made some massive mistakes in navigation. I’m going to have to try this trip again sometime. I *KNOW* I can improve the time. Another thought to consider. It was only in the movie that Jupiter was the destination. 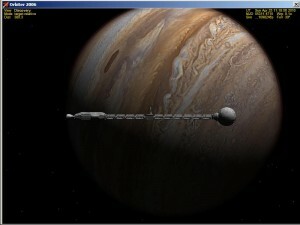 In the novel, the trip only used Jupiter in a slingshot maneuver to send the ship on to Saturn, nearly twice as far away.